Your buffel grass is not growing as big and bulky as it used to? Your buffel grass is pale green or yellow instead of being dark green, especially after rainfall? Your green panic is only growing underneath large trees? Your grass tussocks are smaller, with few or no seed heads? Other grasses are now present in what were pure sown grass pastures? If you have, it is likely your pasture is suffering from nutrient tie-up also known as rundown and is no longer growing as much feed as it could. Sown pasture rundown is the decline in pasture production over time. Sown pasture grasses are initially very productive when they are planted after clearing or in fertile cropping soils. However, their productivity typically declines over time. This decline is not caused by a net loss of nutrients from the soil but from the ‘tying-up’ of plant available nitrogen in the crowns, roots and organic matter of old grasses. The impact on your bottom line will vary with the age of the pasture and the natural fertility of different soil types, however it’s estimated that rundown has reduced grass growth by up to 50% across large areas of sown pastures, with flow-on effects reflected in similar losses in carrying capacity and weight gains. These productivity declines are ongoing, and it is estimated that over the next 30 years rundown will cost the grazing industry in Queensland more than $17 billion dollars if improvements are not made. reduced animal performance and liveweight gain. Rundown buffel showing a blanket of small, yellowing tussocks with poor growth and no seed heads. Renovated buffel versus rundown buffel. Note the difference in colour, growth and seed production. Photo courtesy of Shaun Salter ‘Gaybrielle Downs’, Teelbah. Rundown buffel grass showing the change in colour, production and seed heads following nitrogen application. Pasture rundown is caused by a lack of available nutrients, mainly nitrogen. It is not caused by a net loss of nutrients from the system. During the period when land is fallowed, either after clearing native vegetation or after a crop is harvested, high levels of available nitrogen accumulate before pasture is planted. This causes very high productivity and dark-green newly established grasses. The high intake of this available nitrogen by sown grasses, coupled with a lower rate at which nitrogen is cycled back into the system in a plant-available form over time (i.e. through organic matter breaking down), reduces grass production. In short, the demand for nitrogen is greater than the supply. 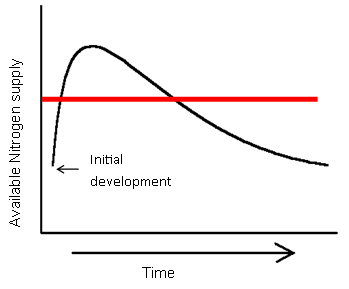 Grass productivity over time from initial development until nitrogen rundown – the red line shows the constant level of nitrogen needed by a sown pasture to maintain optimal growth. In a rundown pasture the nitrogen is still present, but in organic matter and cannot be used by plants until it is mineralised. The nitrogen is still present, but as organic matter. Are sown pasture rundown and declining land condition the same? Pasture productivity decline is not only due to nutrient rundown. It can be the result of a number of factors such grazing management when the stocking rate is not matched to carrying capacity leading to declining land condition, or a consecutive run of poor seasons over many years. 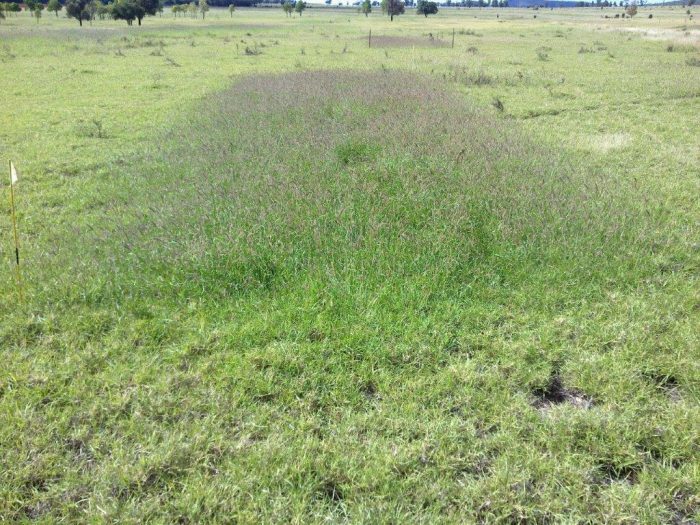 Sown pasture rundown is often confused with declining land condition, and although the symptoms and outcomes are similar, the causes and management of the two are quite different. The following table briefly explains the difference between these two commonly used terms. Definition Sown pasture rundown is the decline in pasture production over time. Land condition is a measure of the health of grazing lands, and their ability to respond to rainfall and to produce useful forage. 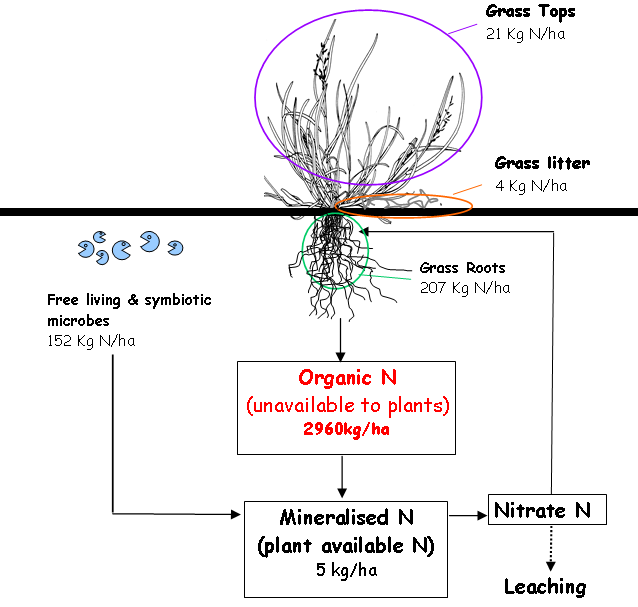 Causes Caused by a lack of plant available soil nitrogen for pasture growth as nutrients become tied-up in the crowns, roots and organic matter of old grasses. A decline in land condition is often associated with overgrazing through a failure to match stocking rate to carrying capacity, leading to loss of desirable pasture species, soil degradation (low ground cover and erosion) and a reduced capacity for the land to capture and respond to rain (less infiltration and more runoff). Note: nutrient availability is not measured. Management Accept lower pasture production, increase nitrogen cycling and increase nitrogen inputs. Improve grazing management by matching stocking rate to carrying capacity. Read more about land condition. rainfall (very small nitrogen inputs). There are two options to increase nitrogen levels: adding fertiliser or adding a legume to the pasture. More detailed information about practices to increase nitrogen levels is available at Sown pasture rundown 2: Strategies to increase nitrogen inputs. 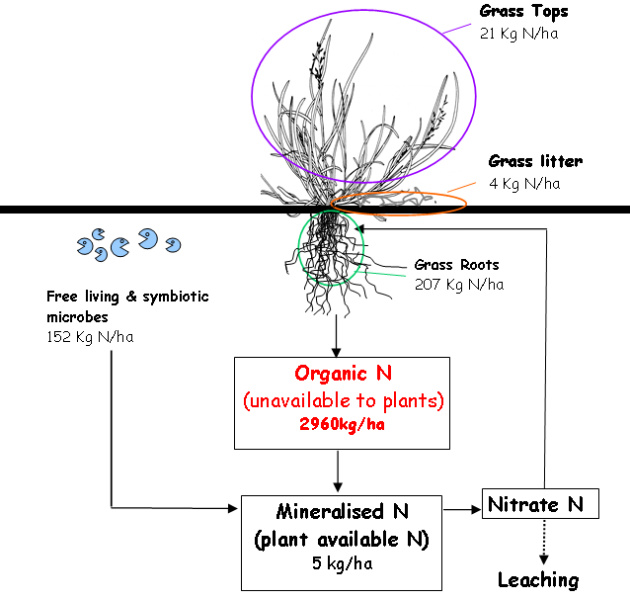 Management options that increase nitrogen cycling promote the release of unavailable nitrogen in organic matter into forms available for plants to use. This can be achieved mechanically (i.e. by cultivation) or via crop and pasture rotations. More detailed information about practices to increase nitrogen cycling is available at Sown pasture rundown 3: Strategies to increase nitrogen cycling. Accepting lower pasture production is not recommended as a sensible management strategy for dealing with sown pasture rundown. However reducing stocking rates to maintain individual animal performance and land condition is the most commonly used management strategy. This is generally not a conscious decision, but rather the end result of managing seasonal variability (i.e. droughts), achieving poor results from other management options, lack of knowledge on management options or cost constraints. While good grazing management to maintain land condition can maximise rainfall capture, it will not stop nitrogen tie-up (rundown) from occurring. The more forage that grows, the more nitrogen becomes tied-up and unavailable to the grass. 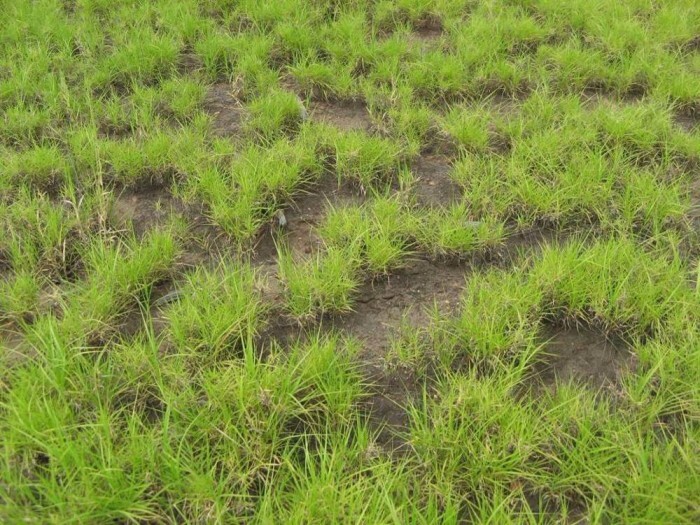 Even in good seasons, pastures that have been established for several years and managed for good land condition will suffer reduced production because available nitrogen is limited. investing in other aspects of the business, (e.g. water, genetics, fences, off-farm income). A printer friendly version of this information is available on our Fact sheet: Dealing with sown pasture run-down: symptoms, causes and management (PDF, 1MB). You can view the webinar Sown pasture rundown: the productivity decline of improved grass pastures by clicking here. 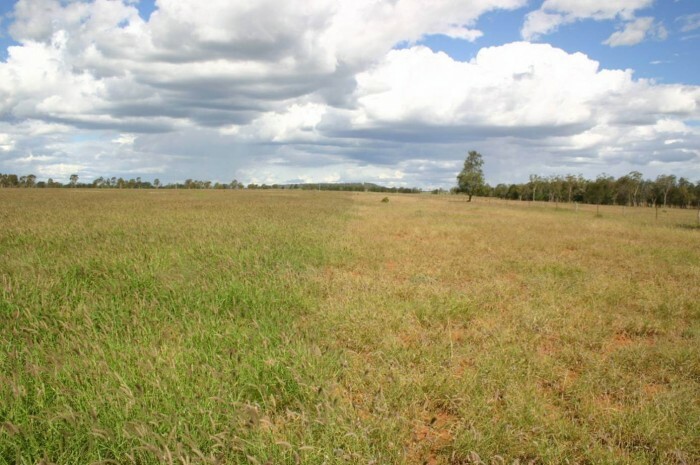 For more information about sown pasture rundown contact the Department of Agriculture and Fisheries on 13 25 23 (cost of a local call within Queensland) or 07 3404 6999 or email callweb@daf.qld.gov.au.